Discovery of an ancient shipwreck off the coast of Jacksonville sparked a legal battle between a treasurer hunter and the Republic of France, according to an article by The Florida Times-Union. A private salvage and treasure hunting company located the shipwreck and filed a claim for ownership. The Republic of France asserted a legal claim as well, contending that the shipwreck was once part of the French fleet. If the parties are unable to resolve their dispute, the U.S. District Court for the Middle District of Florida in Orlando will likely review the case and render a determination. In terms of history, Florida was once the site of an imperial battle of wills between France and Spain. France maintained a colony in Jacksonville, Fort Caroline. Four French ships set sail in the 1560s to assist Fort Caroline. But severe weather conditions pushed the French ships off course, leaving Fort Caroline nearly defenseless. The Spanish seized the opportunity, marched north and captured Fort Caroline. This set the stage for Spanish control Florida for several centuries. Until the present discovery, historians wondered what had happened to the four French ships. They never arrived in Fort Caroline or elsewhere. But after the present discovery, France believes the picture is clear and claims ownership of the ships under the Sunken Military Craft Act (SMCA). The private salvage and treasure hunting company disagrees, arguing that the wreck is a merchant vessel. If the wreck is a merchant vessel, then France does not have a valid ownership claim under the Sunken Military Craft Act. Instead, the private salvage and treasure hunting company would get an 80 percent ownership stake in the wreck, with the state of Florida receiving the remaining 20 percent. What is the Sunken Military Craft Act? 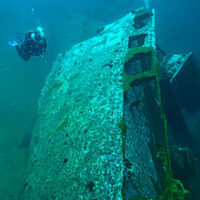 Enacted in 2004, the SMCA protects against unauthorized disturbance of sunken U.S. military ships and aircraft. Essentially, the SMCA makes it clear that sunken U.S. military equipment remains the property of the U.S. military. Without prior authorization from the U.S. military, no one can disturb sunken U.S. military equipment. The SMCA also protects against unauthorized disturbance of lost U.S. military personnel. Do You Need Help from a Seasoned Admiralty and Maritime Lawyer? Whether you are dealing with shipwrecks, catastrophic injury, wrongful death or other aspects of admiralty and maritime law, getting started can be tough. With a complicated history and countless treaties, regulations and rules, navigating this arena is no easy task. That is why it is important to seek advice from a seasoned admiralty and maritime lawyer. Michael F. Guilford, P.A. in Miami, Florida has longstanding experience in a wide range of admiralty and maritime law matters. If you have questions about shipwrecks or other aspects of admiralty and maritime law, please do not hesitate to contact Michael F. Guilford, P.A. at your earliest convenience.